What a week! I have finally made it through one of my busiest weeks for Cozumel Chef and I can now reflect on that wonderful weekend getaway my husband and I took a few weeks ago to Isla Holbox. When we decided to take this trip we knew that by mid-December we would need a breather from our busy lives and the “high-season” of Cozumel. We were torn between Isla Mujeres (which we will visit one day for the whale sharks), Holbox or an expensive trip to the big city D.F. (that too we will visit, but perhaps during Semana Santa when all the Mexicans from Mexico City come to Cozumel). Isla Hobox is another island that is part of the Mexican state of Quintana Roo (same as Cozumel). Located just north of Cancun, Holbox makes for an easy and convenient long weekend getaway from Cozumel, though we learned that it would have been easier had we rented a car rather than take the local bus (Note: bus ride from Cancun is a stop & go 3 hour ride without a restroom, but Holbox in reality is only an hour and half drive from Puerto Morelos, so yea…taking the car). Just like Cozumel you have to take a ferry to get to the island. 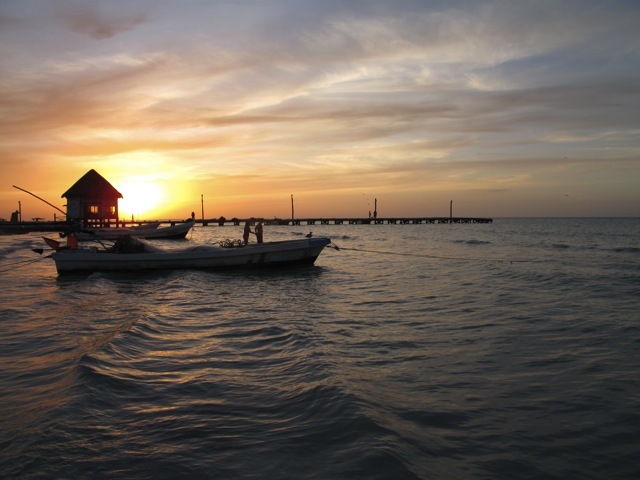 There are small boats waiting every hour for you at the small fishing village of Chiquila to take you to Holbox. This island has remained relatively untouched by tourism. The streets are made of sand and the main mode of transportation is by foot, bike or golf cart (we took a Taxi golf cart to the hotel from the ferry dock!). The Italians seem to understand the natural beauty and bounty of Holbox and have built a few boutique hotels and with that some fantastic restaurants (I will get to these later…I can honestly say the Holbox offers a lot for a foodie)! We booked a three night stay at Hotel Mawimbi an adorable hotel/ beach cabana combo. I was charmed immediately as the central house of the hotel was the owners living room and decked out kitchen. I delighted in peaking at the kitchen every day, looking at all the glorious pots and pans hanging and day dreaming of owning a B&B on the beach somewhere…(Hotel Mawimbi owners…can you adopt me so I can inherit your hotel?). Hammock hanging, beach bummin and barefoot walkin, that was the gist of my weekend in Holbox. I immediately took to heart the idea of walking barefoot all weekend. Pawel certainly “raised a skeptical eyebrow”, but as soon as we dropped all bags in the hotel room, “all shoes were off”. I even went running one morning…BAREFOOT and I loved every minute of it. In addition to all of this relaxing we also did a fair amount of eating. As I mentioned Holbox has been found by the Italians and in my experience when Europeans are involved, there is usually good food…and when there are Italians there is Pizza! and pizza baked in a real oven! We didn’t get to try it, but will certainly next time as my fellow Cozumelenos have told me Holbox is known for the Lobster Pizza. We instead had a three ooey-gooey stinky cheese pizza which we flecked with red pepper before eating (spice on everything…yes we have become Mexican in some ways since we have moved here). Other highlights of our weekend eats: fresh handmade-raviolis from Los Peleones. Los Peleones I highly recommend as these guys are doing something fun with food. Christian and Chef Sebastian, the owners, are just a couple of young guys interested in the creative aspects of food and they offer some whimsical dishes. We tried what we thought to be a basic caprese salad, but was served hot with the mozzarella melted. Delightful on that “fresco” night! I also had the portobello stuffed raviolis which the stuffing was a true “duxelles”, something that I appreciate since coming from culinary school. For dessert…a dish called “Migas de Chocolate” (translated crumbs of chocolate). This dish consisted of large chocolate granola pieces sitting on top of olive oil & chocolate sauce served with a scoop of homemade ice cream. Who would have thought olive oil & chocolate? So yummy. Holbox was just getting ready for the high-season. I am sure there are other delectable eats, but all were on the cusp of opening the week following our stay. I however, have fallen in love. This island with very little put out some amazing food (sushi included, forgot to mention…Pura Vida a great little sushi joint on the main square). We also took an island bird tour to learn a little more about Holbox and do some sightseeing. It is amazing how rich in fowl life Holbox is. We saw flamingos and a bunch other species in which I delight in the prospect of bringing my father here who is an avid bird lover. The tour guide took us to other various small islands located around Holbox which we learned there are a total of 20! We also learned that Holbox is more like a peninsula, it is actually connected by marshlands to the main part of the Yucatan Peninsula! Holbox is one of the Yucatan’s best kept secrets (please keep it this way…or at least the streets unpaved). The gentle whispers of the wind, the sounds of the sea and the gentle putter of golf carts really make you lose yourself and let go of all worries….Holbox I will be back again one day! Nice post. We hope to visit soon. I want food photos, food photos, food photos. Next time. You are welcome! I can’t wait to come back! Was in Cozumel 1 day over Christmas – discovered Carlos and Charlies – what a fun time. We were on a mini cruise – maybe a longer one next year. Cozumel has so much to offer…you will have to go off the beaten path and discover some other places besides Carlos & Charlie’s….if you are looking for REAL Mexican food you should join one of my food tours (check out TripAdvisor for reviews). Can you tell me if this easy to get to from Play Del Carmen. I will be heading there soon and this place sound exactly like our type of place too! @Anne-Marie…this trip is very easy to make from PDC. From the Playa del Carmen bus terminal, take a bus to the main Cancun bus terminal. In Cancun you will have to buy tickets for a bus from Cancun to Chiquila (a small fishing village just across the way from Holbox). The bus ride from PDC to Cancun is about 45 min and then the long hull is from Cancun to Chiquila, but so worth it. I hope you get to enjoy this trip while you visit MX!